There is a saying in China that you are lonely if you don’t eat meat. Vegetarianism is not big in China. Many of those that eat a vegetarian diet do so because they are too poor to afford meat. People that choose vegetarianism voluntarily are generally considered wackos or very religious Buddhists or Taoists. Chinese dishes made with pork and freshwater fish such as carp, catfish, and bass are common. 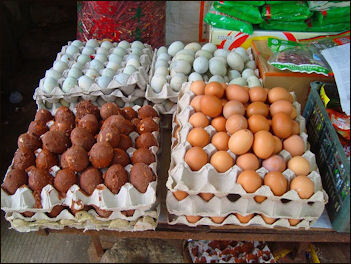 Other dishes are made from chicken, duck, pigeon, goose, eggs (from chicken, ducks and pigeons). Beef is considered an expensive luxury. China is the world’s top consumer of meat and grain. Chinese eat twice as much meat as they did in the mid 1980s. Meat production reached 76.5 million tons in 2005, a 5.7 percent increase from the previous year, and more than twice as much as the United States, and is expected to keep rising at a rate of 5 percent a year as disposable incomes rise and people can afford to eat more meat more often. Chinese eat about 50 kilograms of meat a year compared to 122 kilograms in the United States. Traditionally, Americans and Chinese ate about the same amount of pork, with Americans eating far more chicken and beef. Meat consumption in China increased from around eight kilograms per person a year in 1961 to around 50kilograms in 2007. In the last 20 years vegetable consumption by the average Chinese of has decreased by 50 percent while the consumption of meat has increased 81 percent and eggs 51 percent. China is seen as a growth market for chicken consumption in the future. Chinese now consume chicken at a relatively low rate per capita. By 2025, according to to some estimates, chicken consumption will surpass that of pork. 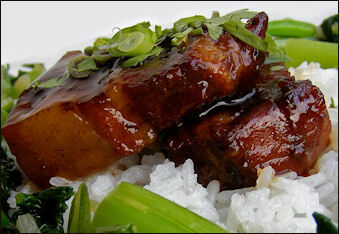 Chinese often have meat dishes, usually made with pork or poultry, for lunch and dinner. Pigs, ducks and chicken are widely eaten because these animals will eat almost anything and the can be raised almost anywhere. Chicken dishes often have lots of bone pieces in them because the chicken is hacked apart with little consideration to the bones. 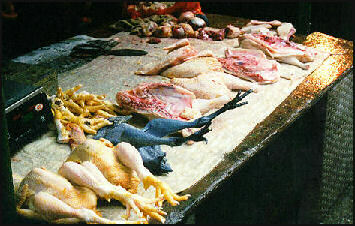 Chinese eat other kinds of bird. Fang Xiaowen, once the highest ranked woman on the Forbes magazine list of 50 of China's richest entrepreneurs, made a fortune breeding pigeons as sources of food before expanding into peacocks, ostriches and emus. The Chinese eat every imaginable part of every imaginable animal because meat is in short supply in their overpopulated country and they have to take advantage of the few animals they have. Supermarkets and department stores sell Ma Ling cow's tendon, White Lotus pig's trotters in gelatin, Sunflower pork luncheon meat, and China National Foodstuffs boneless chicken pieces in spicy broth. Because of a lack of refrigeration, the Chinese have developed the habit of keeping a potential meal alive as long as possible. Fish and lobster at restaurants are kept in tanks and ducks and pigs are slaughtered shortly before they are sold. When transported, pigs are inhumanely placed in cramped cages and stacked on three-decker vans. Thirty or forty are sometimes tied together and carried on the back of a bicycle. Wal-mart appeals to local tastes by offering popular Chinese products like live frogs and eels and turtle blood. Some stores offers live river fish, eels and turtles that are slaughtered right on the spot. Sometimes customers catch them in fish tanks with nets, watch as a clerk guts and cleans them and then take them home in plastic bags along with the bloody organs. Shoppers have turned up their noses at the idea of buying dead fish wrapped in plastic and Styrofoam. Pork is the most popular meat in China and its price has a big impact on the public's inflationary expectations.Pigs are the main source of protein in China as they are in Southeast Asia, and Melanesia. The Chinese eat about as much pork per capita as Americans and collectively eat about half the world’s pork. Pork consumption has risen with China’s prosperity, increasing by 45 percent between 1993 and 2005 from 25 to 35 kilograms. During the 1990s, pork production increased by 70 percent, with much of the growth occurring in densely-populated coastal areas. "When someone says they're eating 'meat' in China, they mean they're eating pork," Feng Yonghui, an industry analyst for the pork market website soozhu.com, told the Los Angeles Times. "Most people can't live without it." Chinese eat every part the pig and often consider the ears, tongues and snouts to be the choicest parts. Unlike other domesticated animals, pigs are prized as source of meat and little else. They can't be ridden, milked or used to pull or carry things. But they are one of the most efficient sources of meat. For every 100 pounds of feed consumed by a pig it produces 20 pounds of meat (compared 14 pounds for chicken and 7 pounds for cattle). A Chinese adage goes, "The world will be in peace as long as there are grains and pork." favored curs of mear include ribs, lean tenderloin and juicy pig's feet, known as zhu ti. On all the ways she can cook pork at home a 71-year-old grandmother told the Los Angeles Times, "I can make mu shu pork. I can stir fry it with carrots and cucumbers. I can even 'red' cook it," Wang said, describing the famous sweet and sticky braised pork belly favored by Mao Tse-tung.” Roasted pig is sometimes prepared in a Chinese Box, a sheet-metal-lined plywood box. In parts of southwestern China, pigs are gutted, salted and sealed. The meat inside the hide stays preserved for years. National Geographic photographer Micheal Yamashita samples some and said it was "sweet and quite tasty." Shi Zhijun, owner of a Beijing restaurant that sells pork-filled steamed buns, told the Los Angeles Times, "Eating pork is good for people. Everybody should eat at least a half-jin [500 grams] every day. It's very nutritious?” It helps people grow. If you don't eat pork you will be very thin and weak." Pork is used in half the items on the restaurant’s menu. China, by far the world's biggest producer of pork, is home to about half the world's porcine population with 460 million pigs. That's about seven times more than the United States, the second-largest producer. It takes five months to a year to get piglets ready for slaughter. Populations have been growing in recent months. Still, Feng of soozhu.com says there's little policy makers can do but sit and wait. "The government has limited options," he said. "They can import more, but most of the production is already in China." Pork prices are unusually volatile because some farmers stopped raising pigs after a 2007 outbreak of blue ear disease killed hundreds of thousands of animals and prompted Beijing to destroy millions more. In 2011, several forces were behind the striking surge in pig prices. One was reduced supply, stemming first from an outbreak at the start of the year of a disease affecting pigs, as well as a scandal involving dangerous additives found in hog feed, which forced some farmers to slaughter their herds. Farmers have also been squeezed by rising corn prices and labour costs, which have flowed through to the price of meat. "The things pigs eat now cost more than what people eat," a farmer named Li Nahou was quoted as saying. 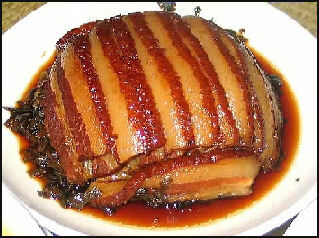 Analysts predicted prices of pork would continue rising in 2012. "It takes time for farmers to increase their hog stocks, so it is unlikely we will see a price drop any time soon," said Ma at CEBM. But some analysts also said that with the hog disease no longer affecting livestock and feed prices starting to fall, pork prices may ease earlier. "Pork prices are still on the upswing, but we reckon the rise will be shorter than that in the previous cycle of 2007-2008. Pork prices could peak sooner than the market expects," said Ting Lu, an analyst at Bank of America Merrill Lynch in Hong Kong, in a recent report. In Beijing, soaring pork prices have left pork peddlers like Wang Qiang despondent. Sitting in the quiet butcher's corner of an otherwise bustling market, he said his sales have dropped by a third since prices started rising in May. Two of his three competitors at the market closed shop in June, discouraged by sluggish sales. "I'm losing money every day," said Wang, 28, as he rearranged the meat in his refrigerated display case in an effort to catch shoppers' eyes. "People are buying less because they think it's too expensive." 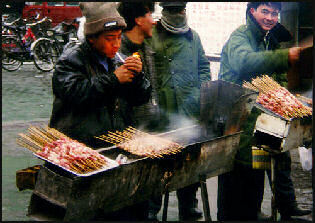 High pork prices have changed the eating habits of ordinary Chinese. Unable to afford pork they are eating more poultry. Chicken consumption is expected to triple between 2008 and 2013. Individual shoppers and restaurateurs are cutting back. "It was 11 yuan a jin (half-kilogram) here a few weeks ago. Then 13. Now 15!" one shopper, Shu Ying, told Reuters before she left empty-handed. A retired woman told AFP, “We can hardly afford meat now, it's too expensive,” explaining that she and her husband now only enjoy that privilege two or three times a month. The Chinese government gave no details of measures to cool pork prices but said farmers cited high costs for corn used as pig feed. Economists generally believe monetary policy won't hold down pork prices, but Chinese policy makers must be wary about recent signs that price rises are spreading from food items to services. Some researchers and market traders urged the government to release some of its reserves if prices keep rising. The government has also ordered food processors and other consumer goods makers to hold down price rises. Chinese drink 1.3 ounces of milk a day, compared to 25 ounces a day by Americans. However, milk consumption in China is rising about 15 percent a year as the government promotes it as a heath drink for children and this is beginning to have global impact on milk supplies. According to reports from the U.S. Foreign Agriculture Service, Chinese yogurt sales grew 15 percent in 2009, and dairy consumption overall is expanding 10 percent a year. Since dairy consumption remains low by the standards of the developed world, the report noted, it is expected to continue growing fast. The government plans to double dairy production by 2013, adding millions of cows to the dairy herd. The Chinese have traditionally not liked dairy products. Traditional Chinese dishes rarely have cheese, milk, cream sauces, or butter or other dairy products in them. Many Chinese will eat dog meat but not touch any dairy products. They find the smell very offensive, and can smell it even on people’s clothes. Some Chinese who consume dairy products get cramps and diarrhea became they lack an enzyme in their intestines that helps them digest lactose (the predominant sugar in milk). Depending on the region, between 70 and 100 percent of Chinese have a lactose deficiency. The unpleasant consequence of consuming milk products can be negated by eating fermented forms of milk such as yoghurt and cheese, in which the lactose is broken down into more easily-digestible sugars. Consumption of milk has increased in recent years in part because of a government directive issued in 1998 for children to drink one glass of milk a day in school at lunch to address a lack of calcium in the traditional Chinese diet. There have been dramatic increases in the consumption of milk, yoghurt, cheese and fast food and pizza with cheese, and milk for lattes and coffees. The trade grew rapidly, from virtually nothing in the 1990s to 377,805 metric tons worth $278 million in 2009. Then suddenly in 2010, it all went awry. China began imposing stiff duties---including a tax of more than 100 percent---on those American chicken parts. The move was in response to a request by Chinese chicken farmers and processors, who claimed the U.S. government was unfairly subsidizing the American poultry industry through low feed prices and then selling the “chicken paws,” as they’re known in industry parlance, into China at below-market cost. The Chinese move raised an interesting legal question: How can the United States be dumping an item at below cost in China when that item is considered virtually worthless at home? “It’s taken what used to be a part of the bird that had to be disposed of in the United States and turned it into a revenue stream,” said Scott Sindelar, the Agriculture Department’s attaché at the U.S. Embassy in Beijing. “Our industry cannot allow something as unjust as this to stand because of the precedent it sets for other countries,” said James H. Sumner, president of the USA Poultry and Egg Export Council in suburban Atlanta. But he added, “We hope this does not negatively impact a lot of other areas of cooperation we have going with the Chinese poultry industry.” Many here and in the United States suggested that the duties were really the Chinese government’s retaliation for the Obama administration’s decision in 2009 to slap tariffs on Chinese tires, fulfilling a 2008 campaign pledge while trying to bolster the ailing U.S. tire industry. 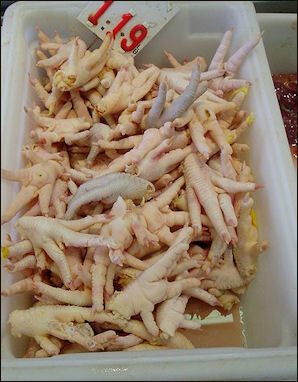 Keith B. Richburg wrote in the Washington Post, “Also hurt in the cross fire have been China’s legions of chicken feet consumers, who are known to like the plumper, juicier feet of American chickens. And with China facing several food safety scares, some food producers and customers said they prefer the imported paws, which they consider cleaner and higher quality. Other chicken-producing countries, such as Brazil and some European and Middle Eastern countries, have tried to fill the void. But also there has been a different solution to the impasse---a burgeoning black market for U.S. chicken paws, coming in illicitly to avoid the high tariffs. The purchasing manager for Youyou Food Co. in Chongqing City, a major chicken foot distributor, said many Chinese importers now first ship the American paws to a third country, and then relabel them before bringing them into China to avoid the higher costs. ‘so the tariff doesn’t really cause any problems for us or other chicken feet consumers in China,” said the manager, who asked to be identified only as Peng. According to recent Chinese media reports, customs inspectors in Nanjing have investigated four incidents of frozen American chicken parts being smuggled into China since March and arrested a dozen people. Xinhua, the state-run news agency, reported that on Nov. 9, the provincial government in Yunnan province destroyed 450 tons of smuggled frozen meat, including pig’s feet, cow’s stomach and chicken paws, some of which came from the United States. In May 2013, Xinhua reported that police had arrested more than 900 people in a food tampering operation that routinely passed off rat, mink and fox meat as mutton. Chinese authorities seized 20,000 tonnes of illegal meat products. Responding to the scandal, police in Zhejiang province posted a guide to distinguishing between real and fake mutton on China's most popular microblogging site, Sina Weibo. Here is a translation of their instructions: 1) “Today I'm going to share with you how to distinguish between real and fake mutton. If you don't look carefully, it's very hard to tell the difference – both have streaks of red and white meat. But after a bit of careful observation, we can tell that there's really a big difference. For fake mutton, the streaks of white and red meat are separate. The white is white, and the red is red. The white and red streaks in real mutton are interlocking. The streaks are very distinct, and look very natural. The best way to tell whether the mutton is fake is to thaw out the slices. After they've been thawed, fake mutton slices immediately revert back to their original shape. Lets look at the following pictures. After the fake mutton is thawed, the red and white streaks come apart at the slightest touch. 2) Another thing that's different about real mutton – when we tear the slices by hand, the white and red meat stick together. The quality of the meat is very natural. Look at the real and fake meat slices after they've been completely thawed. It's obvious – with fake mutton, the red and white parts are completely separate. And they look like they were pieced together. The streaks on the real mutton slices are also very obvious. They look very natural. 3) Put the fake mutton into the hot pot to boil for a bit and take a look. This here has been boiled for about two minutes. After hitting the boiling water, the fake kind began to fall apart, and the colour became unnatural. For real mutton, the meat tightens up. Now do you know how to tell the difference between real and fake mutton? A Xinhua report cited by the South China Morning Post notes that the chicken feet were smuggled across the border from Vietnam still frozen. Once in China, they were processed with various chemicals, including bleach, to add weight and improve their coloring, making them appear fresh. Chinese consumers took to the internet to react to the bizarre news. Some users called the contraband "Jiangshi Fengzhao," or "zombie chicken feet," while others had a more tongue-in-cheek response, postulating that the expired feet might "have a flavor of history," Xinhua notes. This latest revelation once again highlights consumers' concerns over food safety in China. According to the South China Morning Post, border police have intercepted seven different smuggling attempts in the past year, seizing 20 million yuan (about $3.3 million) of illegal chicken feet.